Gemmayzeh is a neighborhood in the Achrafieh district of Beirut it is Beirut's artistic bohemian quarter, an old district full of narrow streets and beautiful historic buildings from the French era. The neighborhood is well known for its trendy bars and pubs, cafes, restaurants and lounges; most are directly located on Rue Gouraud, the main thoroughfare that cuts through the middle of the district. 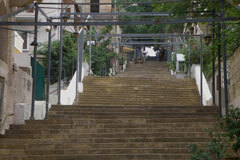 The street leads to the Saint Nicolas Stairs, also known as Escalier de l'Art, where art festivals are held every year. 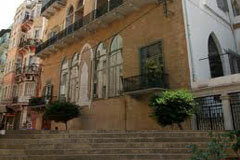 The stairs also lead to Rue Sursock. 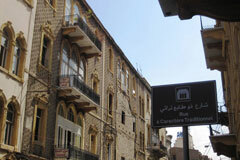 The street is also walking distance from Rue Monnot and Saifi Village. Also known as the L'Escalier de Saint-Nicolas is a public stairway in Gemmayzeh between Rue Gouraud and Rue Sursock uphill. Its proximity to the Sursock Museum and the Greek Orthodox Archbishopric of Beirut on Rue Sursock, make the 125 steps and 500 meters span staircase, believed to be the longest in the region, a very popular destination for tourists visiting Beirut. The stairs are also referred to as L'Escalier de L'Art due to the numerous Gemmayzeh art exhibitions that take place on the stairs since 1973.